Good news for customers of Cincinnati Bell as the Android-powered HTC Sensation 4G has arrived on the network and can be had for $249.99 with a two-year agreement after a mail-in-rebate. The Sensation 4G will be able to reap the benefits of the HSPA+ network that Cincinnati Bell launched in their home network in July. It will also be capable of roaming off of other carriers towers so fortunately you will not be limited to Cincinnati if you want to enjoy the wonders of 4G speeds. The Sensation 4G is nothing short of its name and is a popular smartphone that is currently offered by T-Mobile. The main attraction of the handset is of course its Android 2.3 Gingerbread operating system. It also features a 4.3-inch S-LCD (540x960) display and is powered by a dual-core, 1.2GHz Snapdragon processor. Around the back of the device is an 8 megapixel camera with Dual LED flash that can also record video in full 1080p HD. A front facing VGA camera is also present to help you video chat with your friends and family when you’re on the go. 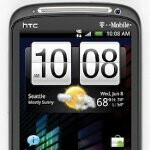 If you want to pick up the HTC Sensation 4G you can right now for $249.99 after a mail-in-rebate. Of course that price is when you sign a two-agreement with Cincinnati Bell. If you already have the Sensation 4G then tell us what you think about it.